Marriage may be an ancient institution, but that doesn’t mean you have to take an old-school approach to planning your wedding. The devil is in the details, and when it comes to your big day, there are a lot of details. Ditch the notebooks and go digital with these apps that put your wedding plans in the palm of your hand. Stay on top of your to-do list with WeddingHappy, the app that turns your phone into a virtual wedding planner. Create your wedding task list, set deadlines, and get automatic reminders to keep you on track and help you remember when important things, like vendor contracts, are due. You can export and email the entire schedule to people who are helping you plan, or assign individual tasks via email. The app also integrates a vendor management system that allows you to keep your vendors’ contact information in one place and associate tasks to specific vendors. 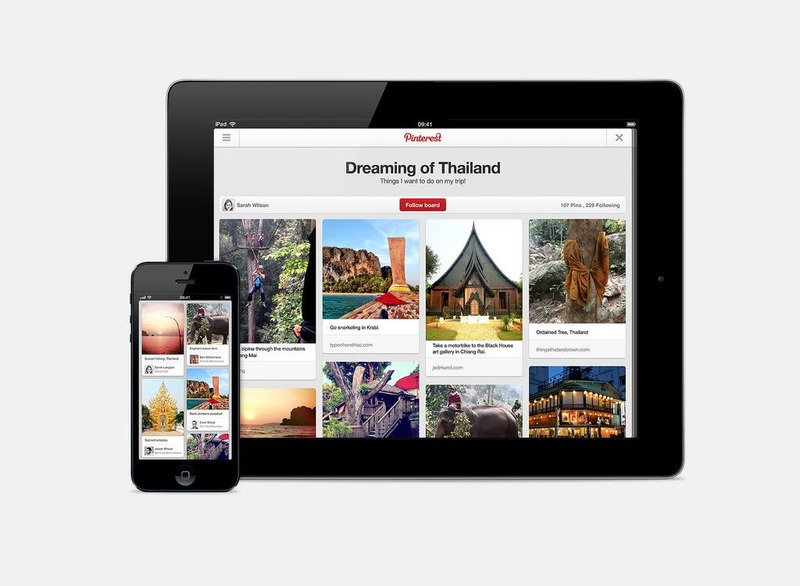 Gather inspiration papercut-free with Pinterest’s mobile app. Create boards for every aspect of your wedding—food, flowers, dresses, décor—and have all of your ideas accessible at the touch of a button. Collect ideas from anywhere on the Web, or use the built-in camera feature to snap photos of everyday items that inspire you. Get instant access to expert advice from The Knot, one of the most popular wedding-planning communities on the Web. The “Ask Carley” section offers up a library of tips from the site’s founder, covering everything from the cash bar dilemma to the best way to cover a tattoo. 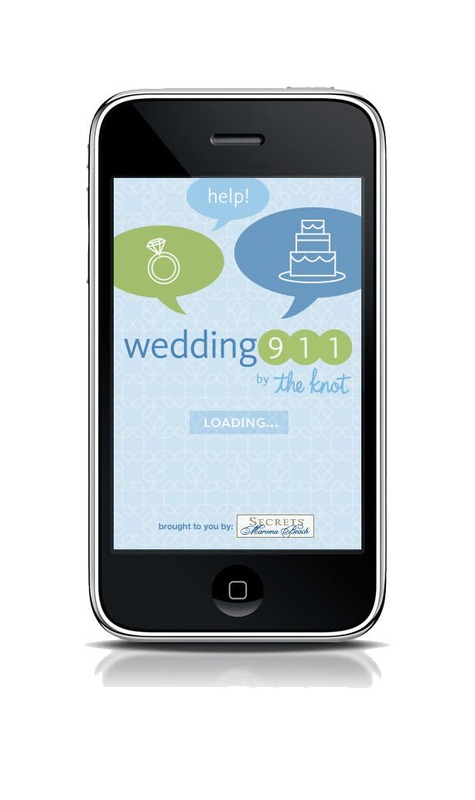 For quick help on more offbeat topics, the “911” button connects you to the community for real-life advice from other brides. Weddings involve lots of purchases, and it’s easy to go over budget without realizing it. 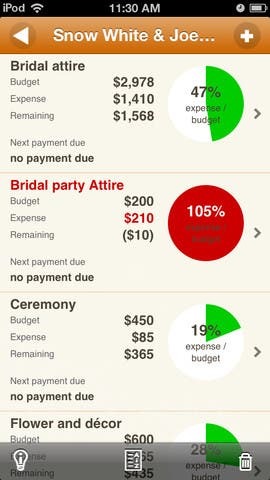 Wedding Budget offers plenty of options to create your own custom wedding budget and track every cent spent. The app offers a quick glimpse of how much you’ve allotted for each category and how much you’ve already spent, with color-coded graphs showing whether you’re over or under budget. WeddingScan makes registering for gifts super-simple—just point your phone’s camera at the bar code of any product, and it scans it and adds it to your registry. 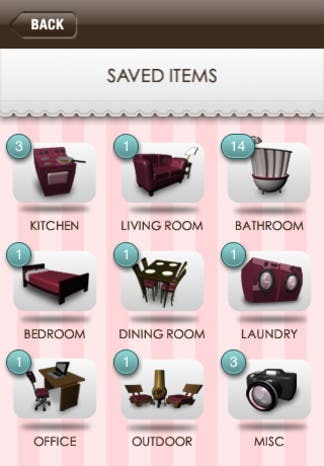 All of the items on your registry are consolidated into one easy-to-browse list, available on the WeddingScan website and within the app, making it easy for guests to find the gifts you actually need. Share event details easily with Appy Couple, a free app that lets you create your own private wedding website. 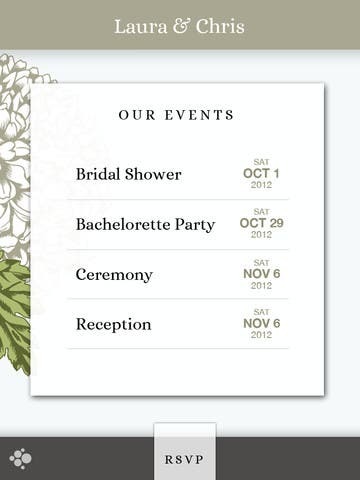 Add important information like event schedule, dress code, directions, menu choices, and more to your site and invite guests to RSVP and check in. During the ceremony and reception, guests can upload their photos directly to your Appy Couple website. All guests must log in using your personal wedding code, so only the people you invite will be able to see your information and photos.